Discussion in 'The Ultimate Fighter (TUF) Discussion' started by cheese32165, Jun 3, 2014. Most of you may already have an account ,but I worked out their is roughly over 6000 members. So if you are new to MMA then I recommend you check out the video below. BTW I'm not a official owner of high level member of tapology, I just thought surly more than 6000 people should be aware of this site. One thing the video doesn't mention are the tournaments, for example I'am 5th in the UFC spring tournament. Proof. It's a pretty good site for making picks and MMA discussionat a very reduced pace compared to sherdog. 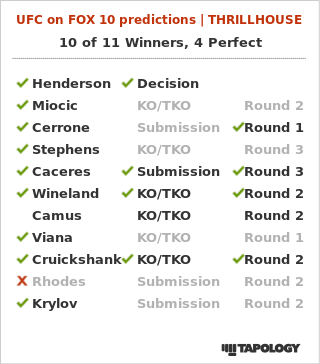 3213 picks with an ok 62.2% ,would be higher but use to pick all the events back in 2011/12 which brought my percentage down as I was doing complete random fights. Now I just do UFC , Bellator, One FC, KSW, Road FC, Some UK shows like cage warriors and bamma and any others I plan on watching. I signed up just in time for the start of the Summer 2014 Contest. The $500 cash prize was motivating, plus it's fun. I'm currently in 333rd place after UFN 45, with plenty more events to go.